Doug: (Gulp) "Yea, we can fit it in." (In my mind I am trying to figure out how I am going to get this car into the schedule). I definitely recommend a thorough vehicle inspection before any kind of a road trip, but I also recommend scheduling your appointment no less than a week or two in advance. You want to give the shop time to repair any problems that may be uncovered, especially if parts have to be ordered. The other reason is to give you some time to drive the vehicle locally after a repair to make sure everything is right before getting too far from home. This is especially true if it is a major repair. With gas prices as high as they are, you will definitely want to pay attention to the maintenance that affects gas mileage. Things like the ignition components, air filter, tires, steering and alignment can all play a part in affecting your fuel economy. Don't ignore a Check Engine light; if it is on, you will want to get this repaired as it could have an effect on gas mileage and the drivability of the vehicle. While it may be necessary to add a car-top carrier or a bike rack, the addition of them to your car will have a significant impact on your fuel economy. Try hard to get by without it, and you could save quite a bit at the pump. As for safety, nothing is more important than good tires. You can have tires that have fairly decent tread on them but should still be replaced. Make sure you don't see any cracking or checking on the sidewall of the tire. We sometimes refer to this as dry rot; if you see this, do replace the tires. These tires could be prone to a blow out at speed on the highway, especially with the extra vacation load and the higher summer temperatures. If you are towing a trailer of any kind, don't forget that it needs service, too. Have your shop inspect and repack the wheel bearings, especially if it's a boat trailer. Going in and out of the water can be very hard on the wheel bearings. Pay attention to the condition of the trailer tires as well; if you don't have a spare for the trailer, you should get one. Be sure you have a jack and a lug wrench that will work on the trailer wheels because the one for your car may not fit. Lastly, make sure all of the lighting on the trailer works -- marker lights, brake lights and turn signals. 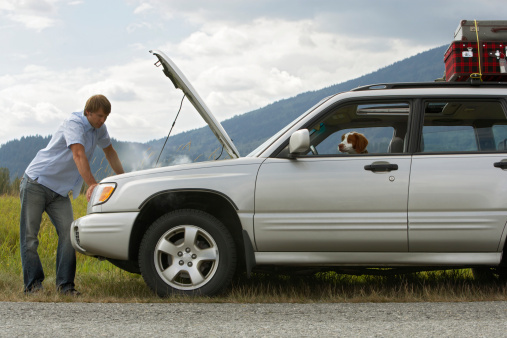 With a little planning and preventive maintenance, you can have a trouble-free driving vacation.